Grappa is a grape-based type of brandy that comes from Italy. It is made out of all the stuff left over from making wine (grape stems, skins, pulp) called pomace. It can be made up to 120 Proof or 60% alcohol by volume. 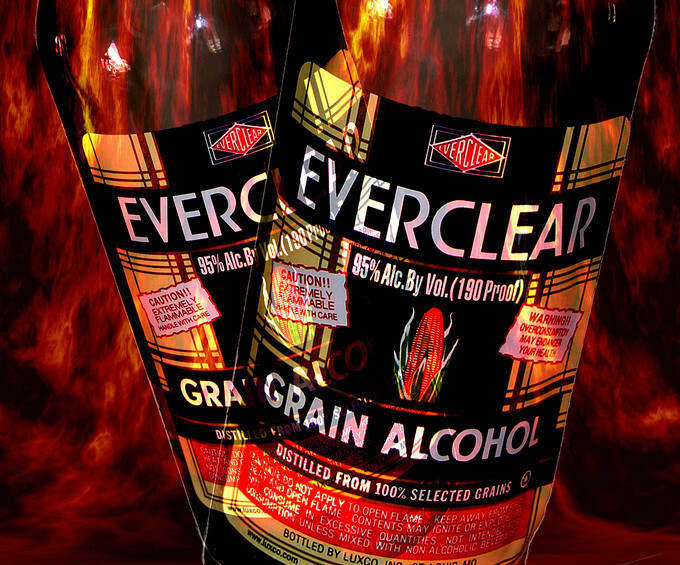 At 75.5% alcohol by volume, this infamous rum is highly flammable. Did you know it even has a stainless steel flame arrester in the neck of the bottle to prevent it from catching fire accidentally. In fact, Bacardi has actually been sued after a customer was badly burned in a bartending stunt gone wrong. Fresh out of Jamaica, this drink is named after the stomach acids of vultures that are found on the island. Apparently you can do anything after drinking this. Most (sane) people only use this vodka as a mixer because it is so dangerous to drink. This is a triple-distilled vodka, native of the Balkan Peninsula. Distributed in 20 countries, this vodka is 88% alcohol by volume and one of the highest in the world. It contains 13 health warnings on the bottle! Created in Scotland, this drink is made in part with wild elderflower and milk thistle, which support liver health based on Chinese medicine techniques! It is sold as vodka “concentrate” and contains 65 shots vs other vodka’s of similar size at 26 shots. Originally from Switzerland, this drink was banned in the early 1900s in the US because of “alleged” psychoactive effects. They eventually legalized it again when they realized the effects were no different than just plain old being black-out drunk. At 89.9%, we are inching closer to the magic number. This Scottish whiskey is the most alcoholic on the planet! It is quadruple-distilled – giving the drink its incredible strength. It is also single malt! According to legend, “one sip and you live forever; two sips and you go blind; three sips and you expire on the spot”. We are at 92% abv. This is made of the same constitution of Golden Grain. This is a great mixer, but is basically rubbing alcohol. Oh and it’s illegal in most states. We’ve just about come to the end of the list. If you’ve been tasting while reading along, you’d most likely be close to death and this last Polish vodka will be sure to keep you dead. This drink was finally made legal in NY State in 2010. This Bolivian alcohol is made from sugar cane and is so high in alcohol (96%) that is served in a metal can. Happy Drinking!